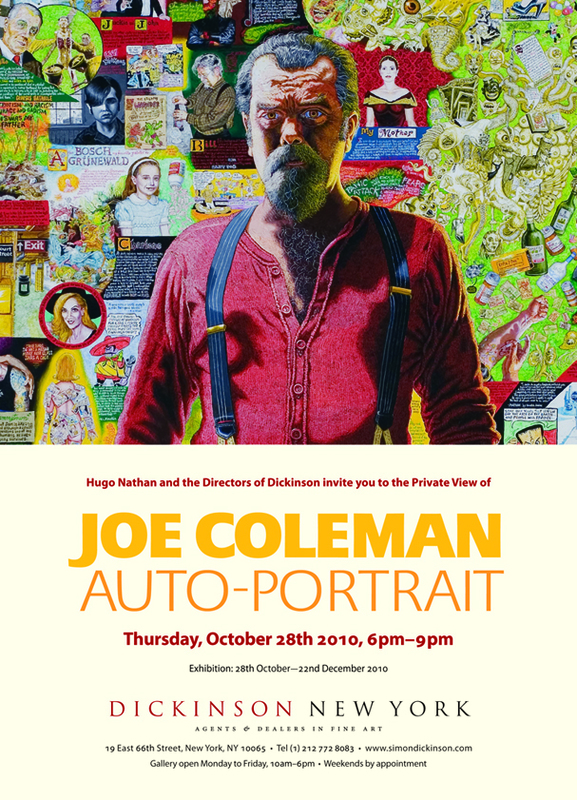 Joe Coleman’s portraits create complete biographies by surrounding their subjects with interweavings of miniscule images and explanatory text. Artist and viewer embark on exploratory excavations of the subject’s life through the painting. Coleman’s jewel-box approach means that one experiences the paintings afresh at each viewing, uncovering ever more details and nuances that were previously undetected. An admirer of Northern artists such as Bosch, Brueghel and Grunewald, Coleman employs the same attention to detail and delicate sense of scale, utilizing dual and single haired brushes in conjunction with magnifying lenses to create his refined masterpieces. Like those artists, Coleman also displays a propensity for the gruesome and grisly and often attempts to both dissect and glorify the terrible in many of his paintings, unmasking with brutal honesty the truth of human nature. Centered around a full-length self-portrait, the artist's largest and most ambitious painting to date, AUTO-PORTRAIT is an exhibition of new work that provides a fascinating look into the life of this enigmatic artist. Painted in Coleman’s intricate technique, the almost life-sized portrait is surrounded by a tapestry of formative scenes and personages from the artist’s life, presenting the viewer with a captivating biography of the figure at its center. Presented with this large-scale composition will be a series of miniature altarpieces. Painting on 'found' diptychs and triptychs, Coleman has produced portraits of himself, his family, and other personal subjects, all imbued with the intensity of religious icons. The devotional format not only gives each picture a sense of veneration, but also references Coleman's long-standing affinity for early Renaissance painting. Auto-biography has long been the focus of Joe Coleman's painting and this new body of work represents the artist's most personal and intimate group of paintings to date. All of the works in the show are new and have never before been exhibited or published. A fully illustrated catalogue including an interview with Tom Sachs will accompany the exhibition. For more information please visit Dickinson New York.